XML Error with message and location. Definition at line 203 of file xmlstorage.d. Definition at line 206 of file xmlstorage.d. Definition at line 219 of file xmlstorage.d. 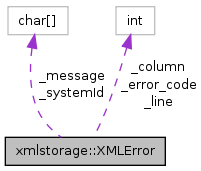 Definition at line 214 of file xmlstorage.d. Definition at line 229 of file xmlstorage.d. Definition at line 230 of file xmlstorage.d. Definition at line 228 of file xmlstorage.d. Definition at line 226 of file xmlstorage.d. Definition at line 227 of file xmlstorage.d.